The geographical and cultural location Dan Halter lives in is both peculiar and specific, with a direct influence on the spirit of his work. Even in a world where everything appears to be connected economically and culturally, no one can fully understand the art of Dan Halter (30 years old, born in Harare, Zimbabwe and working in Cape Town, South Africa for the last couple of years) without linking it to characteristics of the places in which he has lived. 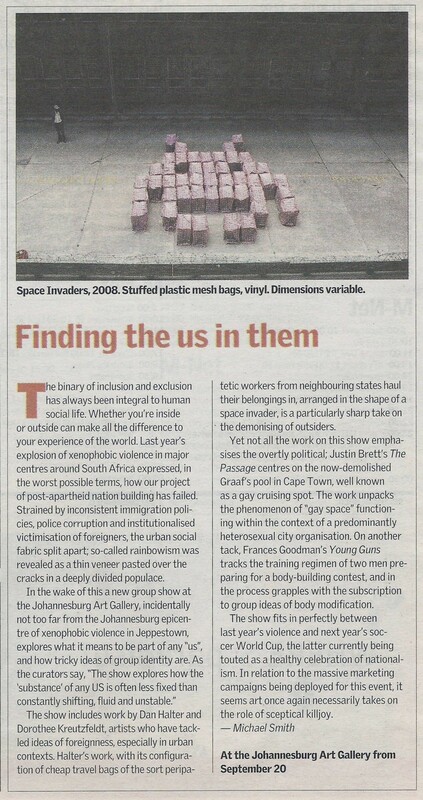 This can be seen in the works recently showcased at the Joao Ferreira Gallery in Cape Town – where he had his first solo exhibition in 2006 – now shown in part in Milan. The profile of the artist becomes clear through works that display, as often today, a wide range of techniques, materials and themes. His work shows the ability to interpret some of the social and economic problems of his native country, without treating them too didactically. It is the starting point of elaborations showing a symbolic and reflexive approach to the world we live in. It aims to activate the possible cathartic function of the art object, moving from the descriptive to the representative. Among the subjects of his work, particular attention is devoted to some aspects of a “local” reality, which properly reflect matters of a “global” nature. The reorder of the national organization through the measure and reinterpretation of land assignment, the surrender to an unbearable inflation, and the continuous presence of the HIV virus: problems that determine the lives of both individuals and the community of the country. This is combined with the aftermath of a difficult post-colonial period. Such subjects would be enough to induce judgement on the degree of influence the “political” sphere may have on the works which, in this way, meet a sensibility typical of the most recent art¹. Considering Halter’s work as a product of today’s aesthetic models, and being able to foresee that it may soon draw interest on an international basis, one still needs to take account of its level of originality. Important in his corpus are maps of Zimbabwe that are made by weaving together shredded documents such as the country’s banknotes, telephone directories and books chosen for their content. The theme of geographical maps, among the most intriguing in the artist’s work are based on linguistic and rhetorical, as well as formal meanings of possible representations. This often blends with an implicitly critical judgement on the way the interpretation of the territory is linked to strategic and political agendas, in a set of rules that readily displays the effect of power. As shown in the studies of a French geographer who devoted himself to studying the meaning of the demarcation of borders, Claude Raffestin, every form of border or territorial subdivision is more or less directly connected to a form of control or possession, and as the Chilean artist Alfredo Jaar underlined in one of his works of 1989, which compared images to the life conditions of the inhabitants of a village in Nigeria with the world routes of oil, in an immediate comparison between “Us” and “Them”, speaking about geography is the same, in some sense, as speaking about war. (“Geography = War” was the title of that work, presented at the “Centre Pompidou” in Paris in the famous exhibition “Magiciens de la Terre”). Even Dan Halter’s maps, with their textual indications, show forms of subordination to an order imposed from on high, but also suggest different possible meanings linked to the phrases embroidered on them, quotations from popular culture and local proverbs. The internal boundaries, marked by the colours of the different areas delineate different farming regions. Every form of description contains a comment or a judgement and there is no neutral denotation, particularly in geography. Whether or not he posed such questions based on theoretical reflections about the geographic discipline, Dan Halter still gives a version that joins the exterior and visible element with an internal discourse, explicitly given by the fragmentation and combination of lines and letters that form the fabric of the map. Observing them directly, in fact, these maps show a refined skill in the process of weaving, that combines linear, vertical, and horizontal arrangements, according to the virtual structuring that is superimposed on each geographical representation to determine a form of orientation, in a unique and fragile tapestry of magical consistency that is reminiscent of Alighiero Boetti’s maps. This technical aspect is differently and personally resolved by Halter. Along with the maps, and confirming a passage through practices that in the artistic field recall conceptual typologies, we then have the print and video elaborations that show without comment the names of the farms that underwent government siezure, a sort of horizontal map, produced by the nominal information, that will become temporal sequence and writing seemingly with no target, monotonous and occlusive. This form of description is also part of a “geographical” attitude that moves towards a proposition, at the image level, of motifs that illustrate the characteristics of a place. Among these there is the use of currencies of a certain kind, and money which forms the fabric of some of his maps, and also provides the theme for further works by the artist, beginning with the two supermarket till receipts. These are from purchasing monochromatic objects, only black or white, interpreting the transaction in a symbolic way, that naturally brings us back to the problem of coexistence of populations with different skin colours, after centuries of colonialism in that part of the African Continent. Putting money at the centre of the aesthetic operation is, in a way, like a form of manifestation or confirmation of an relational aesthetic taken back to its most immediate level, as if through objects, things that are bought or sold, are traces of lost gestures, that are visually recorded, like mental images. One could confer to the artistic object a scope that goes beyond its immediate impact, to inscribe it in a metaphoric dimension, raised above the banality in which the use confines the object. The little stylized statue in fibreglass, that shows an embrace between a black maternal figure and a smaller white child, represents the union and coexistence of different ethnic roots, but its repetition raises it from a banal object of example or decoration to a different connotation, where it is considered as an instrument of communication, more for its function than its meaning. At this level, the modus of interacting with things and images is based on the observation of the conditions of daily life perceived by the inhabitants of a region of the world that the artist interprets, joining the inevitable sense of empathy with what happens in other parts of the world, within a geography of communication efficiently represented by his plastic mesh bags, which are the object in which his writing through a process of sewing is not far from the one of another African artist, Ghada Amer. For the Egyptian artist the procedure of sewing and using it to produce messages regarding the feminine identity is an essential way of working. Halter uses this modus operandi in a way peculiar to some of his works, following a dual approach: technical in the manual aspect that distinguishes a part of his production, and conceptual, using it along with other ways of image communication. 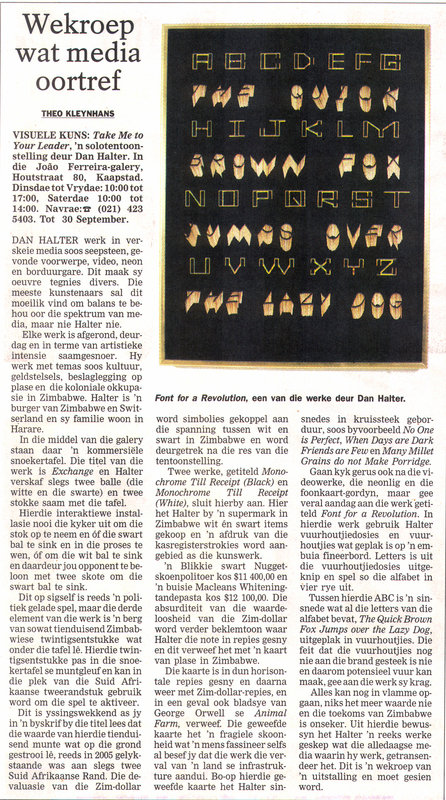 Words become images, for example, in a neon sign, like the word “pefection” instead of “perfection” is enscribed out of a cursive- type script in Black Light, or in the matches and matchboxes forming his original typeface “Font for a Revolution/Zimbabwe”. Often an African proverb is used as a sign of communication based on correspondence between images and words. Halter uses different techniques and forms of elaboration, often poetic, that focus on certain themes derived from reality to convey a sense of precariousness and at the same time vitality in every image that becomes representative of a collective experience perceived and recorded through extremely personal eyes. ¹Dan Halter said in a statement that he is not interested in expressing a specific “moral judgment” in his work, even though he’s deeply interested in representing the conditions of life he observes around him. It’s obvious that a strictly “political” interpretation of his works would easily limit its comprehension to the most immediate denotative level, ignoring the all important formal and symbolic aspects. I don’t like Dan’s art. In fact there is a lot of art I don’t like. But that is not to say it is bad (aesthetically), misguided or insincere. Fortunately my profession demands that I must engage with art that is not necessarily to my taste and art that promotes ideologies that aren’t consistent with my own and to understand its origins, the contexts in which it is produced. I am also required to take into account the technical and visual acumen that informs its production. Unfortunately, all this does not make me like the work. So what is it that I don’t like about Dan’s work? In the first place it is too nice. I have used the word nice for all the innocuous connotations that come with it. I find it as innocuous as some of the terminology that is used these days to describe murder of civilians such as “collateral damage” and “extraordinary rendition” to gloss over kidnapping. A while ago I received an email from a friend with a link called Fallujah Pictures. What I subsequently saw was the kind of thing that messes up your day and makes you lose your appetite but at the same time there was a sense that at least this kind of information was getting out there so it was good because these are the kinds of things that the embedded media finds too inflammatory to screen. Having said that however I had to wonder what I expected to see when I clicked on that link. It is not that I thought that the siege on Fallujah was without casualty or that it would not be bloody. So what is it that made it remote until I saw those pictures? The point about this story is that there are many things in the community of nations that are vile. What do these images of other people and their suffering really tell us about who they are and the places they live? How do you make sense of the conflicting reports that come from those places beyond merely identifying those who look like us and sound like us? What has been interesting in the many discussions that have happened since 9/11 is in trying to define who and what the enemy is. How far in the hierarchy of the world’s victims do white Zimbabweans fit in and how far in the hierarchy of perpetrators do they fit in? What about South Africans and all those nations who think they are oh so good? So when Dan asked me to write for the catalogue it was important for me to understand his work and where it was coming from. Because, in my thinking at least, I have abandoned the desire to write about art in such as way that my text is an elaboration of the artist’s statement. 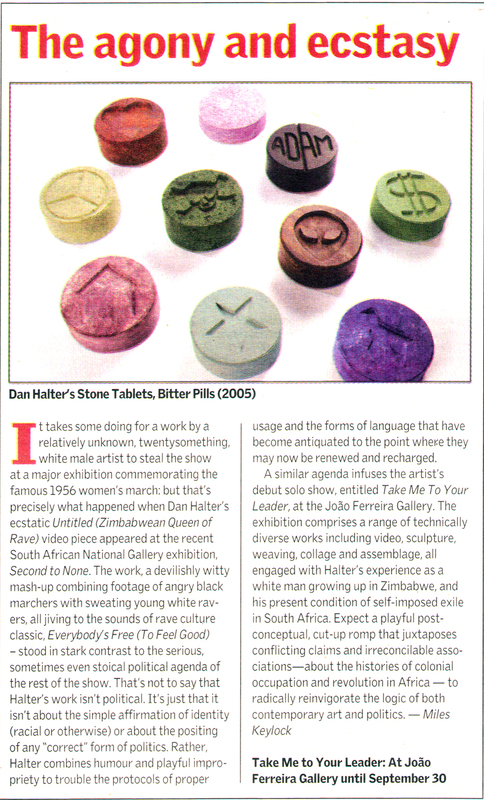 This piece of writing is less about Dan and his art than what I bring with me to the conversation. Not that I have been completely insensitive to what Dan is trying to say but that my engagement is as loaded as the work themselves nor do I expect his work to answer any of these questions. But I do expect him to ask himself and those who are close to him some hard questions and maybe that is precisely what he is trying to do. You see, in light of the very complicated “challenges” of coming to terms with sheer scale of human tragedy that is unfolding around us there was no way that I could write about Dan’s work without bringing all of that luggage with me to the writing process. It is precisely because his work delves into these unsavoury territories of fear, paranoia, race, power, farm attacks both those perpetrated by employees on farmers and by farmers on employees that I have to go beneath the surface of his work. It is like when my friend Joe says there is contempt in the eyes of black people even as they bow and smile and rub their hands. It is that same look of contempt that I see in the eyes of white blue and white-collar workers even while they are calling me “Sir”. But it is necessary for people to take the sting out of what they are experiencing or to lessen the pain of their memories. Dan’s life is replete with the contradictions of being a white person in the world today and if you look closely, behind the lines so does his art. 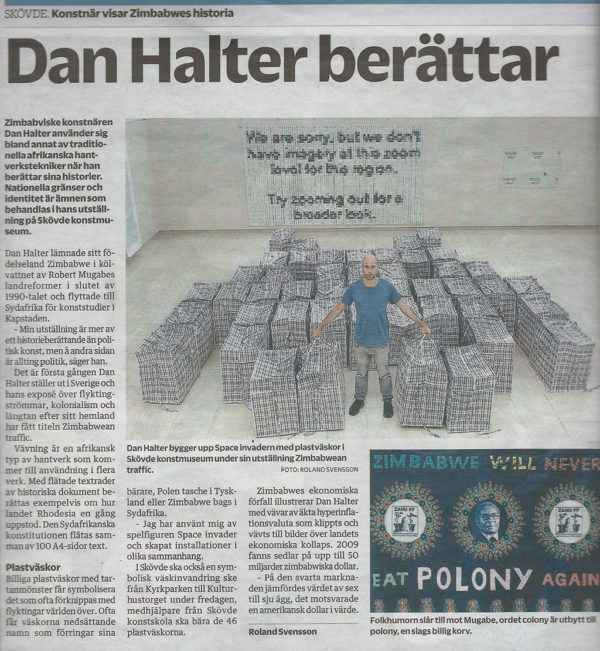 You see from where I stand it is easy to dismiss Dan’s work as the anxieties of a white Zimbabwean bemoaning his paradise lost and to reduce his experiences here in South Africa as a spoilt rich boy who does art to titillate himself and his Michaelis-trained friends. And so I dislike the fact that his art is cool. 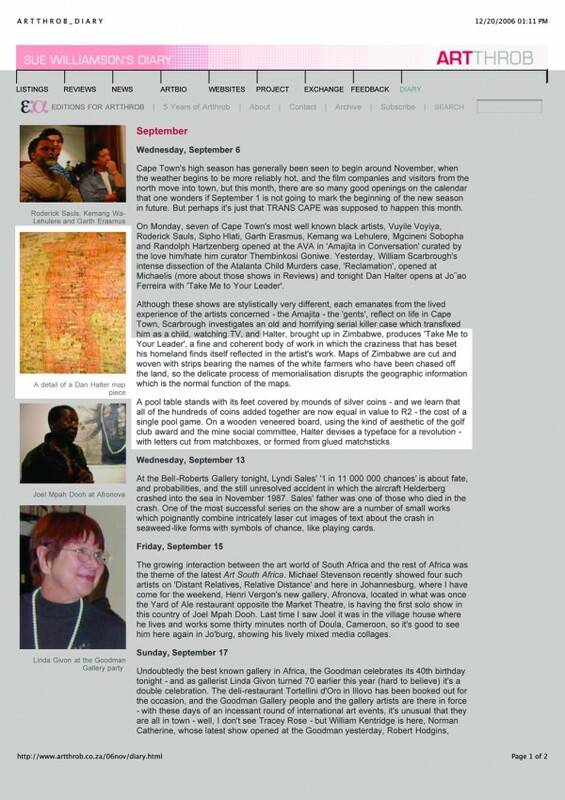 It is also the thing I detest I a lot of South African art. How can you aestheticise horror? Perhaps to do so is the only way to deal with it without letting it consume you. To stare at it obliquely lest you be blinded by the sight, to understand it, to come to terms with it. Maybe not to make peace with it but at least to come to terms with it and ultimately to confront it. So maybe I have spoken too soon. There are of course many other things that are implicated in the subject-matter that the artist is delving into: the machinations of the liberal press, the viciousness of the attacks, arbitrary state power, the besieged settler mentality and its gun culture that is so aptly described in Michael Moore’s “Bowling for Columbine” and one that afflicts many a community including many white South Africans, large sections of the Israeli population. There is also embedded in discourses about Zimbabwe many of the same assumptions that frame the way people talk about African societies which is to look at contemporary African society solely in terms of what has been lost instead of what has been gained as well as the possibility of what can be achieved. In all fairness though there are no spaces in the chaotic world that we live in that do not in some way compromise us in some way even less when you are trying to earn money from the art industry, so I can’t judge. But I do judge. Because what is art other than something to be sold. An artist once said that his paintings are like his children. Well you don’t go selling your children, I thought. But then again we do and a whole set of other gruesome things as well. These are all the kinds of things that happen in which we are implicated in one way or the other. And for those of us who chose to do or say something about them have to take some responsibility for what we say. Our motto should be: let me judge so that I too may be judged. So what is to be done? The one thing that can be done is that we can take responsibility for the person that we are or have become. For instance Dan is white and that’s not his fault but he still has to take responsibility for it. The same applies for the fact that he holds a Swiss passport, that he is an ex-Zimbabwean living in South Africa and a man that lives in a Capitalist society that demands he sell his produce. It is a terrible feature of contemporary society that you have to be accountable to a society that you had no hand in creating. But he is also as artist and on that score he has tremendous power to determine what he produces. I don’t know what his art would look like if it was to bring all of these issues to the fore. I certainly do not want to see blood-splatters and severed limbs. That is something for Dan to solve as his career develops and as he delves ever deeper into these murky waters. A conciliatory note to Dan is that he could do no better if he was a flower painter. No one could. It is unfair to expect another Guernica but the video of toyi-toyi/rave video starts coming close to exposing that raw nerve but it still panders to being cool. In the end to know your enemy you have to also know yourself and one of the ways you get to know the enemy is by looking at his art. If Dan’s work is able to make South Africans and Zimbabweans look at themselves with the disgust they deserve, maybe then I might like it a bit more. Good luck Dan. You have your work cut out for you. Imagine a jaw so strong, or possessing through frustration or anger such strength, that it can crush stone. In breaking stone this way would it not also shatter teeth? And what would the shards so broken do? Would they not lacerate and embed themselves in the palate, the cheeks, even the throat itself? These pills cannot be intended to be chewed. Should the mouth patiently wait for them to dissolve? How long would saliva take to reduce these and have them absorbed? One year? Two? A lifetime? But thinking like this is folly: these pills are far too large for human consumption — they are not pills at all but stone inscribed — tablets bearing signs, such as are borne by oracles and prophets. If we read we find nothing profound, however. These signs are merely the graphics that are commonplaces on pills that used to be taken to induce euphoria and escape the everyday. A paradox then: an ecstasy tablet that cannot be consumed. Its material indissolute, its fabric threatening violence. These pills are not for healing, nor are they for inducing euphoria; neither do these tablets convey secrets or set down precepts. They will not be carried from the mount to the people; rather by their shape and size and weight they would be better suited for the same people’s hands. These stones then are for throwing. Imagine for a moment that you are guilty; that you have been the cause of a terrible calamity. That the world has changed due to your hand. Not your hand exactly; not you as such but rather due to actions of your parents; their parents even: the spirit that you have lost but which drove them. You are guilty by proxy, if you will. By your inaction then you are guilty. This is a double blind: to be inactive is wrong; to act is wrong. How then do you act? Maybe act free. Rozalla said this: ‘Everybody be free.’ But what then? Free to be free? That surely is not enough. What are we to make of trauma? Simple, explicable trauma that we experience every day of our lives. Let me help you start: ‘I have a friend….’ Start with that sentence and now complete it with a traumatic ending. It is easy. Say ‘who died of cancer after a long struggle’, or ‘who is a car guard on Long Street’ or ‘who has been unfairly dismissed from her job because she is pregnant’ or ‘who has never really known love’. These are but the simple variations. What does freedom mean here? The works of Daniel Halter often seem to exude a sense of the irony at such freedom, it would seem to me. It would appear that they celebrate our freedom to be unhappy, to be disappointed, to be cheated, robbed, hurt or displaced. His works shower us with their subtle melancholy, a melancholy so subtle that others see it as mirth. There is undoubtedly humour here, a solicitude expressed in wit, but nonetheless sweating unease and anxiety. 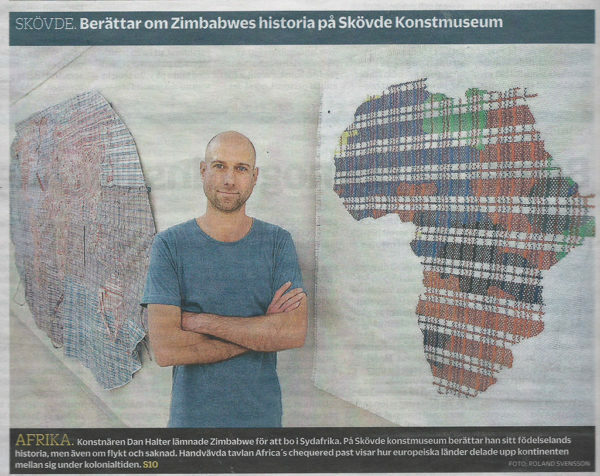 Halter is careful with his materials: hard wood and soapstone, both authentic; coins and banknotes, demonetised on the eve of this exhibition; maps and till slips, acquired from the land of his birth, Zimbabwe. And yet somehow the materials do not hold their form: the soapstone chips, the hardwood might be a veneer, the till slip fades and the map distorts under pressure from its interweave. And still, somehow, as if through the pressure of the will of the artist the whole exhibition holds its form exquisitely. Perhaps its form holds as if through a lament, straining from the natural tendency to break, like the voice uttering the dirge. Perhaps when speaking of his works, we should ask if it is rather that Halter really seeks a freedom to make free. As free as a white-owned farm liberated; as free as a dollar demonetised. Maybe this is the sort of freedom here celebrated. His works are deeply labour-intensive, yet not usually overly-laborious. They do not dwell on their hand-crafted nature and even, as in the case of Mother and Child, hide such information. In this we see the hand of the artist as the reverse of that of the stone-thrower. That last-mentioned hand is one that in a casual, thoughtless act puts out an eye, smashes a cranium, takes down a child. The artist takes days and hours and weeks to express a gesture that passes us by; gives a fleeting smile and allows us to file out of the gallery to our next appointment. It is a gesture that allows us to be free to be free. Lastly, he is bound tenderly to life by the thought of his friends; or shall we not say rather, that by their thought for him, by their unchangeable solicitude and love, he remains woven into the very stuff of life, beyond the power of bodily dissolution to undo? In a thousand ways he will survive and be perpetuated. Andrew Lamprecht is an art theorist and curator who also makes art sometimes. 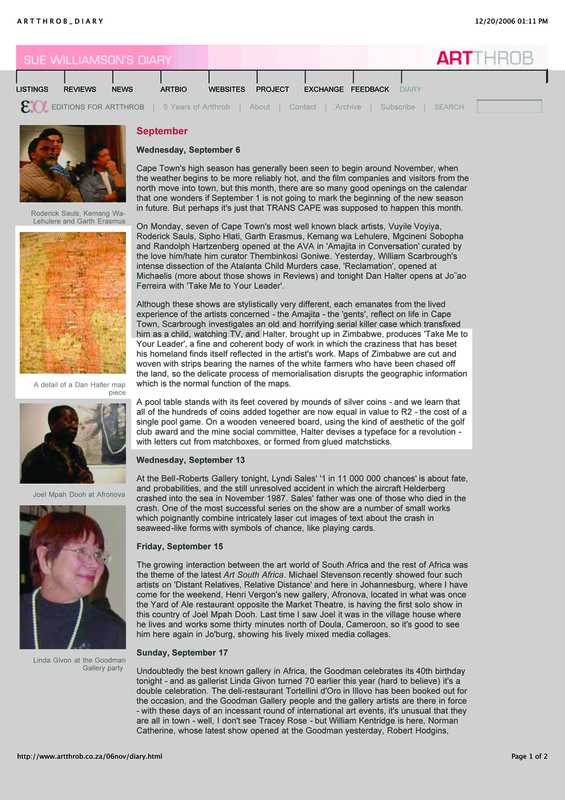 He teaches at the Michaelis School of Fine Art, University of Cape Town.